Many jobs in 2020 will still be low paying. NEW YORK (CNNMoney) -- Stuck in a job with lousy pay? Better get used to it. Some 28% of workers are expected to hold low-wage jobs in 2020, roughly the same percentage as in 2010, according to a study by the Economic Policy Institute. The study defines low-paying jobs as those with wages at or below what full-time workers must earn to live above the poverty level for a family of four. In 2011, this was $23,005, or $11.06 an hour. The economy won't support much growth in jobs with higher salaries, said Rebecca Thiess, policy analyst at the left-leaning Economic Policy Institute, who crunched government data to come up with these projections. "Far too many economic pundits take for granted that the economy of the future will demand far greater skills and credentials," she wrote in a recent paper. While all eyes are on Friday's monthly jobs report to find out how many positions were added in July, a growing number of economists are concerned with the quality of the jobs being created. Lower wage occupations grew by 3.2% over the year ending in the first quarter of 2011, according to the National Employment Law Project. This was fueled mainly by the expansion of retail salespeople, office clerks, cashiers, food prep workers and store clerks, whose median hourly wages ranged from $7.51 to $13.52. Four of the five occupations with the highest concentration of low-salary jobs are set to grow by 2020. These include farming, personal care, building and grounds maintenance and health care support. All have at least 45% of their employees earning at or below so-called poverty wages. Only food preparation jobs, which have the greatest share of low-wage workers at nearly 74%, are expected to shrink a bit. And lousy paying jobs are getting even lousier, as their pay has fallen. Workers at this end of the pay scale actually found their wages shrank in recent years, according to NELP. Between early 2008 and early 2011, low-wage workers' median pay contracted by 2.3%, more than double the rate of mid-wage employees. Meanwhile, higher wage workers enjoyed a small increase in pay. 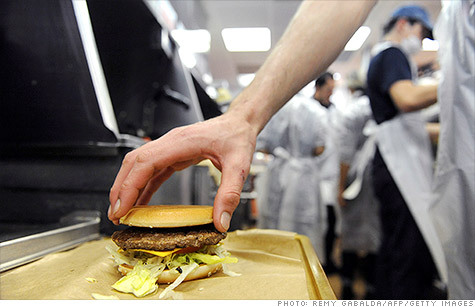 Mid-wage jobs, which were hit especially hard during the recession, expanded by only 1.2%. Higher-salary occupations declined by 1.2%. The predominance of low-wage jobs is not good for either workers or the economy, said John Schmitt, a senior economist at the Center for Economic and Policy Research. These jobs often lack pension benefits and health insurance, as well as sick days and vacation time. There is also little path for advancement. If workers are making low wages, they can't afford to shop and prop up the American economy, he said. Around two-thirds of the economy is consumer spending. Also, since low-wage workers are better educated now than they have been in the past, college may increasingly seem like a questionable expense. "They will start asking whether college is worth it," Schmitt said.